The all-new BMW 5 Series sedan is a smashing success in the US, and here’s proof: BMW dealerships don’t have enough 5 Series units to sell to anxious customers, according to a report from Automotive News. "We just don’t have enough product," stated Sonic Automotive Inc. executive vice president, Jeff Dyke. BMW just can’t build the new 5 Series fast enough and, because of that, at the end of last month there were only 200 unsold examples in dealer inventory – for the entire US. What’s equally impressive is that the new mid-size luxury sedan only arrived in US dealerships in mid-February, but there were 2,000 pre-orders. Fortunately, BMW is fully aware of the problem, which, according to Ludwig Willisch, head of BMW Group Region Americas, "is one of the nicer problems to have." Some of the largest BMW dealerships, such as Sonic Automotive, have about a 15-day supply of 2017 models, along with the same amount of the previous generation 5 Series in stock. As far as smaller BMW dealerships go, however, they’re kind of out of luck at the moment. That all said, BMW has indicated that the 5 Series supply challenge will no longer be much of a problem beginning next month; it’s busy churning out more units this very moment. But for anyone who can’t wait for the redesigned 5 Series to come back in stock and is looking for a good deal, BMW is currently offering some pretty good incentives on the remaining 2016 models. For example, last January the average incentive per vehicle was $11,005. 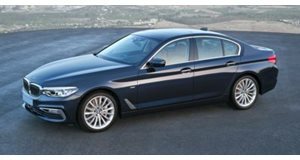 So why such a strong demand for the new 5 Series in the US, considering sales were down for this model in the last few years? Because BMW spent about 20 percent more in advertising than what’s typical for new cars, and now it’s reaping the rewards.